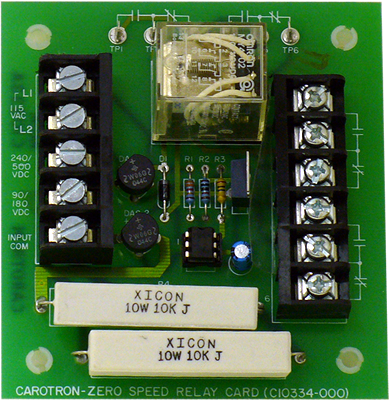 Model C10334-000 Zero Speed Relay Card provides a universal voltage sensitive relay circuit for use in ramp to stop logic for DC motor controls. Armature voltage ranges of 90, 180, 240, or 500 VDC may be sensed for logic control. A voltage input of any polarity is acceptable. When the 90/180 VDC input range is used, the zero speed relay de-energizes at approximately 5 VDC from the armature input. For the 240/500 VDC input range, the switching level is approximately 10 VDC. Four Form-C contacts are available for customer use.